Hello there loves! How are you?! Its been a bit since I've been able to join in on the Crumpets Nail Tarts but things finally worked out and I am back for this weeks theme! I wasn't sure what to do fun this Lilac, pink, and gold theme but then all of the sudden rose quartz came to mind! So since rose quartz seem to be a pale pink I decided to create that as my base. Plus I just haven't really tried it so I wanted to give it a go! I used Morgan Taylor Plumette with Excitement as my base pink. I then used some watered down white and created some big wavy strokes. After that was dry I tried to get a layer effect. So I then put a thin coat of OPI Bubble Bath on top. Its super sheer so I thought it would help give the look depth. Once that was dry I added some extra strokes of white but this time thin, and a touch of gold. Then after that some top coat. I think some time I will try this look without the coat of Bubblebath. Have you done a rose quartz mani before? Anyone have any tricks, or different technique I should try. I would love to try them out! Also if there is anyone who would like to see how I did mine let me know! I could totally do a Tutorial or Paint With Me video if you would like. So after that I had to add in the lilac. I decided to be very literal and just do some lilac flowers. I thought about using this to frame the nails, or have them water fall out of the cuticle area. Yet I just ended up going very simple! Well that is it for today! I hope you all have enjoyed this post! I have a few things in mind for some upcoming posts, but if you have an requests let me know! I am hoping to get some of those more lifestyle like posts up and going again! Check out everyones manis from today theme below!! Lovely look! 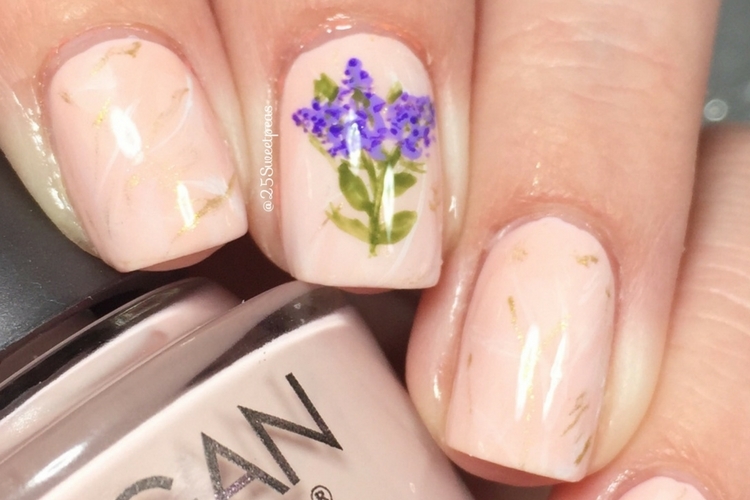 I really love the lilac flowers incorporated into this mani! So soft and sweet. Thank you so much! Its such a unlike me mani, especially for this time of year! I'm all about those bright and bold colors for summer! haha!